Hot tubs are great pieces of equipment to have to help your relax at home after a long day at work, but what happens when you decide a new hot tub is in order or you no longer need a hot tub at all? How do you get rid of that convenience that has now become a major headache to dispose of? Getting rid of anything as large and bulky as a hot tub is no easy feat especially in Brooklyn and the rest of Brooklyn. You can't just bag up that hot tub and throw it in a dumpster. It simply won't fit, not to mention that it will take a good deal of back breaking labor to take apart that hot tub and dispose of it. Besides there are parts of a hot tub that can be salvaged and recycled, which is good for the environment. You best option is to hire a professional company to haul away that hot tub for and recycle those parts that can be recycled. But which junk removal company do you chose? We here at Flat Rate Junk removal is the right company for you. 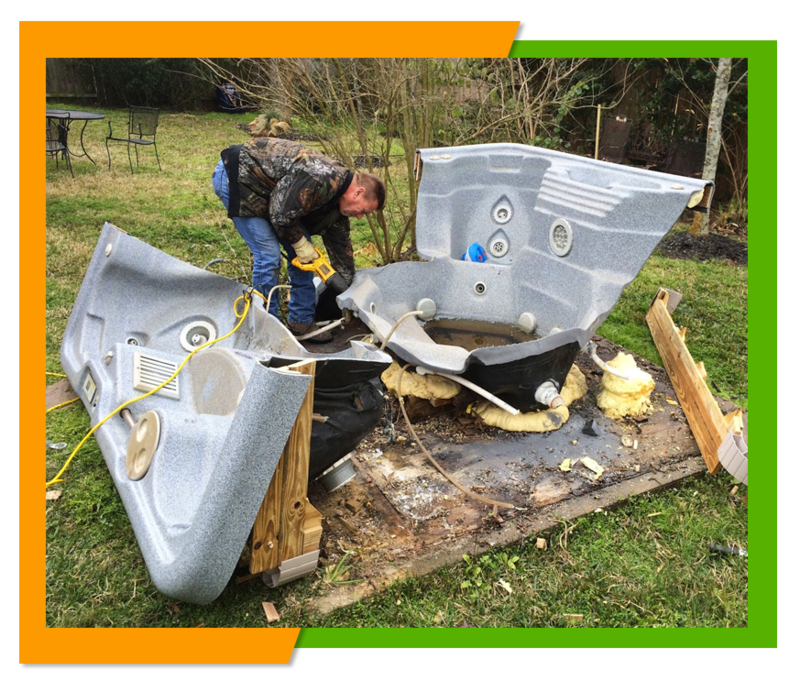 While we acknowledge that any junk removal company can handle removing a hot tub but due to its large size they choose premium prices for removing that hot tub. At Flat Rate Junk Removal we charge one flat rate our flat rate price structure remains the same regardless of what you want or need hauled. After we haul that hot tub for you we will then clean up the area to get it ready for that new hot tub arrival or so you can use the space for other things. In addition our professional 2 men crews are friendly and professional and will make having your hot tub removed as easy and painless as possible. All you need to do is lead us to your hot tub and we will do all the rest for you. 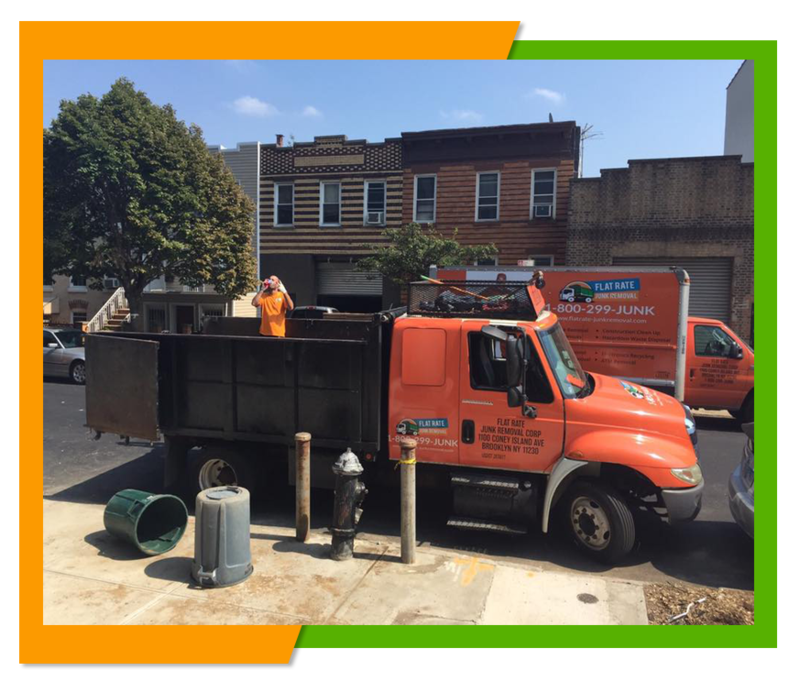 Since our truck has 24 cubic foot capacity why not have us collect any other useless items that you need to have hauled away? Since we charge a flat rate why not take advantage of that hot tub removal to clean out your attic, get rid of any old appliances, or simply have us haul away that junk you have cluttering up space in your garage. We are more than happy to carry mixed loads, in order to make getting rid of all your excess junk easier for you. Although we are located in Brooklyn, we serve most of the NYC city area so why not let us be of service to you. To learn about our hot tub and other junk removal services why not browse through our website right here at www.flatrate-junkremoval.com or give us a call to get a free estimate or schedule an appointment to have that hot tub picked up by us.